One of my favorite times to hike in the Upper Peninsula is during the fall season. Not only do the arboreal colors add to the splendor, but there are usually no other hikers and no bugs. 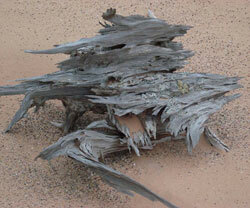 The first picture featured this month is a Ghost Forest stump. The interpretive sign near Sable Falls’ dune walk speaks about the Ghost Forest. The forest that used to be near that sign is almost disintegrated due to weather and tourists taking souvenir pieces. Thankfully, there are several other Ghost Forests sprinkled throughout the dunes. This is an amazing stump now exposed but previously protected by the sand for several thousand years. 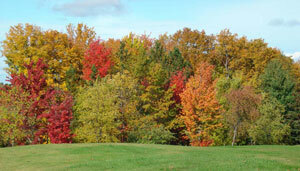 Although I included a fall picture last month, I have to also include the photo below. For what ever reason, the fall colors this year were significantly better than they have been in other years. While attending the first annual agate festival held at Muskellunge State Park, I took an extra day to go agate hunting with my friend, Renee Beaver, at Vermillion Beach. I had never been to that beach before, which is located west of Whitefish Point. It is unusual and different from Grand Marais’ beaches in that the entire beach is covered in a cobblestone-like fashion with flat rocks. The type of rock is similar to that found in Grand Marais, but there are also a large number of golden-colored microcrystaline specimens -- some of which that have water-level type banding. There is also a lifesaving station at this site. This station, along with 3 others at Crisp Point, Deer Park, and the Two-Hearted, were constructed in 1876. Vermillion was known as Station #9, and was opened on May 15, 1877. The station housed the keeper and his family, a crew of 6 to 8 surf men, supplies, life-saving equipment, and guests. The purpose of these stations, of course, was to render assistance to ships in distress and save the lives of sailors on those ships. Even though the southern shore of Lake Superior is known as the “graveyard coast,” these life saving stations were responsible for saving hundreds of lives. In 1888, the state’s largest cranberry farm was established in the marshes behind the station. A small town grew in the area and included its own post office and school. The station remained active, but was acquired by the U.S. Coast Guard in 1915. It became a Coast Guard station in 1939 and was operated until 1945. After decades of abandonment and abuse, as well as theft from vandals and souvenir hunters, the property and more than a mile of beach was purchased in the early 1970s by Evan Nayes. Nayes and the Wildshore Foundation spent years and considerable effort to restore the facility. During this time, and continuing in the 1980s, Lake Superior State University used the facility to conduct research and classes about history and ecology in this fabulous lake-side setting. The Whitefish Bird Observatory has also used the facility in recent years. In February 2007, the Little Traverse Conservancy purchased the property. They hope that this incredible place will continue to provide solace, knowledge, and awe for many generations to come.